Hello music video lovers! 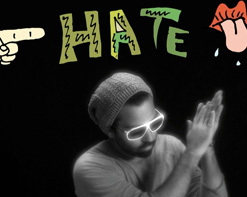 Once again, it’s the HIP Video Promo Staff, proud to introduce a set of videos from a new creative artist, Zahed Sultan. Zahed is one of the first culturally-inspired artists to introduce beats that define the rhythms of world electronic and dance music today. This music producer/social entrepreneur from Kuwait achieves a certain level of commitment to the community and the environment through his desire to inspire and innovate. Upon hearing his music, you’ll discover a mysterious and mystifying power that originates from the electrifying voices of a range of vocal talents featured on his debut album. It is not obscene or out of the question to assume that Zahed Sultan’s musical tastes and influences revolve around a number of eclectic artists/producers. Musicians such as Radiohead, Bjork, Kanye West, Massive Attack, DJ Sasha, and UNKLE have defined his personal musical taste—they have given him a specific amount of time and space to create a globally spreading interest in the genre called electro / alternative music. Over the span of five years, Zahed wrote, arranged, and produced a debut musical album that expands the mind and evokes rhythmic feelings through live instrumentation and electronic beats. His albumHi Fear, Lo Love represents his cultural diversity and mixed heritage. His music ultimately tells stories and promises to deliver complete satisfaction to both the mind and spirit. Both videos, “Walkin Away,” and “I Want Her But I Don’t Want Her” deliver dual emotions of happiness and melancholy to a viewer / listener. In 2004, Zahed’s success began to boom when the house music label Global Underground and DJ Sasha awarded him with the 3rd place prize for the Involver Remix Competition. In 2011, the second single from Zahed’s debut album Hi Fear, Lo Love, was added to the “Hotel Costes 15 Compilation” by Stephane Pompougnac in Paris. This is the first Kuwaiti and Arabian Gulf Region track to ever be signed to an internationally renowned compilation.“Hotel Costes 15” was released in late September of 2011. Since inception, the Hotel Costes series has defined electronic music and has gone Platinum five times and Gold 14 times! The video for his new single, “Walkin Away,” explores ideas that evoke a series of strong and relatable emotions. The concept behind the video brings to light specific exchanges by using two pairs of empty shoes that appear to be interacting around each other, and then ultimately walking away from one another. The objects stand as metaphors for every day scenarios that evolve from personal relationships. The slow and intimate groove of the song captures a certain atmospheric feel that enhances this interesting and mindful video. Throughout the video, you can’t help but notice how the featured vocalist’s voice encapsulates you from beginning to end.. The visual direction of the video helps to expand the significant meaning behind the song, bringing wholesomeness to the delicately crafted lyrics embedded within it. Along with his video for “Walkin Away,” we have included a bonus video for his standout track called “I Want Her But I Don’t Want Her”, which gives us our first glimpse of Zahed himself. The song is entirely performed by a featured vocalist in his native tongue, Arabic, and it captures an obscure dream-like ambience. The video is extraordinarily playful and it features Zahed Sultan in a very rare, yet interesting, state of being. It is clear that his personality is vibrant and colorful; strongly expressed by his musical abilities. The success of this original and rhythmic artist is evident when you are confronted by the humbleness of Zahed’s talent. Whether you speak Spanish or Swahili, Zahed Sultan will leave you in a frame of mind that is respectful of body and spirit. It is with artists like this that we can sit back and appreciate the power of a good beat. We’re thrilled to be working with Zahed, and we bring you these extraordinary music clips with assurance that you won’t be dissatisfied. If you’d like a copy of the full-length album Hi Fear, Lo Love, we encourage you to let us know and we will hook you up! If you need more info, call Andy Gesner or Rob Fitzgerald at 732-613-1779 or e-mail us at HIPVideo@aol.com. You can also visit www.IAmZahed.com to learn more about Zahed Sultan.